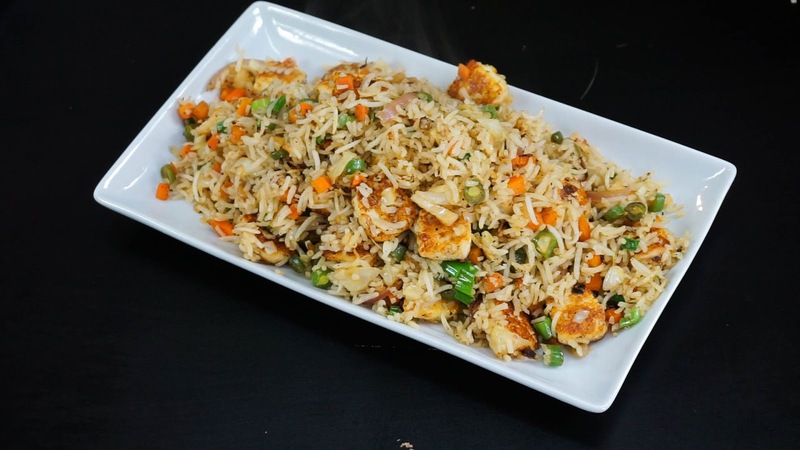 Please click here to watch Paneer Fried Rice in Tamil -Madras Samayal. Step 1) Soak the Basmati rice in water for 20 minutes and cook in water with some salt until the rice is 90% cooked..Do not over cook the rice..To get perfect strands add a tbsp of oil into the boiling water before adding the rice.This prevents the rice from sticking to one another.Once 90% cooked spread the rice on a paper towel to remove any moisture from the rice or keep under fan.This step is very important to get the best fried rice with single strands of rice. Step 2) Season the paneer with chili powder, Pepper , salt and fry it it oil until nice and golden on all the sides. Step 3) Heat oil in a pan and add finely chopped ginger, finely chopped garlic and saute it for few seconds. Then add in sliced onion and mix it. Now to this add cubed Carrot, Cabbage, Beans and cook until the veggies are 80 -90% cooked do not overcook the vegetables we still need to retain some texture of the veggies. Step 4) Then add the sauces - chili sauce, Soy sauce ,required salt and mix it again.You can also use capsicum if you like.Then add the cooked basmati rice and mix everything very gently and carefully, do not break the rice. Step 5) Finally add in the fried Paneer, freshly ground pepper, some salt and some spring onions for garnishing and mix well.